The Fencing Response – what is it? In 2010, 7.7% of NFL athletes suffered concussions on an annual basis. 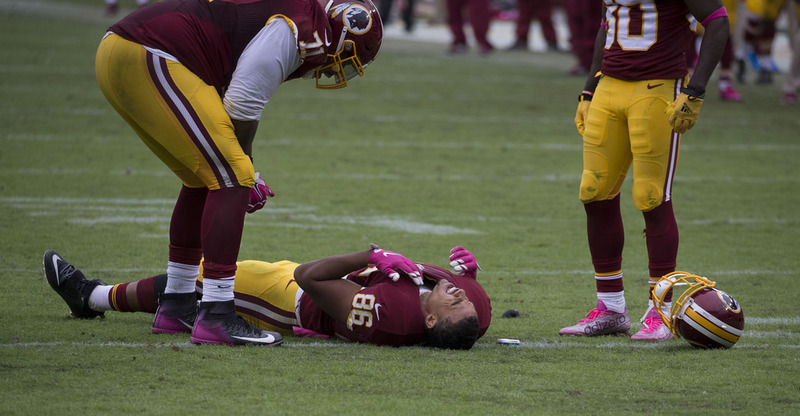 This past 2017/18 NFL season we’ve seen a great deal of head injuries within the game, with some looking more bizarre than others. An example of this was Texans QB Tom Savage who, following a blow to the head against the 49s Elvis Dumervil displayed the fencing response. The management of Savage’s injury has been greatly questioned. Despite being clearly hurt, Savage was kept in the game for a series before doctors evaluated and diagnosed him. Media has boomed around the concerns of players returning to training prior to completion of the recommended 5 day protocol. And rightly so! So yes, the concussion should have been picked up straight away, and Savage should have immediately been removed from the field, but what’s done is done and we can all learn from these mistakes. Are we in Britball any better at recognising concussion? What is the fencing response? How do we recognise it and what should we do if it’s seen in a player? As discussed in a previous blog post. A concussion is a minor traumatic brain injury resulting from a blow (or multiple blows) to the head. The fencing response, a result of concussion, comes from the separation of tonic posturing (increased muscle tension) from convulsion. You can recognise the fencing response through the positioning of the arms following a knock to the head. This comes immediately following forces which have been applied to the brainstem, causing the arms to involuntarily flex or extend for a few seconds. It is believed that the standardisation of on-field criteria for diagnosing TBIs would improve diagnosis and subsequently improve treatment. The fencing response has been suggested as one way to recognise a concussion. In a study by Hosseini and Lifshitz, (2009), the fencing response was evident in 2/3 of videos analysed involving an unconscious individual. 66% of concussed players exhibited the fencing response. This was greater than the symptom of loss of consciousness (approximately 10%). Unlike muscle sprains/strains and fractures which can be obvious to see, TBIs are not. And so when we recognise the fencing response we should definitely not ignore the visible sign of a concussion. It is my concern that there is a lack of injury understanding and management in the wider Britball community. My own observations include game-day paramedics who spend the whole game in the ambulance and refs who do not recognise the symptoms of concussion and ignore the calls from coaches for player removal and medical assistance. When discussing this with fellow coaches, a concern has been raised regarding this being an opportunity for opposing coaches to remove members of the opposite team. The solution perhaps is to pause the game for a medical assessment rather than removing the player for a play. This pause of the game could prevent any advantage gained through the removal of the ‘injured’ player until a diagnosis has been made. Refs should have a duty of care for each team and every player. To not take off a player with an obvious case of concussion is very poor practice and could possibly come back at them further down the line. Everyone must remember that the player is not in their right mind and will need decisions made for them. Equally, it should be the medical personnel and not the refs who have final word over the health and removal of a player. To give someone superior authority with no or minimal medical training is ludicrous! What are your thoughts? Who do you think should have final say about removing a player from the field? Are we not hindering the growth of the sport through poor medical management? Please note that my final comments are simply observations and not personal criticisms of any individuals. I have a great love of the sport and respect for those who volunteer their time. This blog post reflects my endeavour to bring to light various issues and my honest best interests for the safety of the sport. Dorney, K.M., Kessler, A.J. and Bruce, S.L., 2016. The Fencing Response in Concussions to NFL Football Players. Poster presentation at: Celebration of Research and Innovation, Wright State University. Hosseini, A.H. and Lifshitz, J., 2009. Brain injury forces of moderate magnitude elicit the fencing response. Medicine & Science in Sports & Exercise, 41(9), pp.1687-1697. Albensi, B.C. and Janigro, D., 2003. Traumatic brain injury and its effects on synaptic plasticity. Brain Injury, 17(8), pp.653-663.